Recently a friend lent me a wonderful book, More than Petticoats: Remarkable Wisconsin Women, by Greta Anderson. 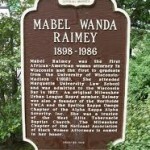 * The book biographies a number of notable Wisconsin women, but the biography that stood out the most to me was of Mabel Watson Raimey. Ms. Raimey has been recognized by other Marquette faculty. Professor Phoebe Weaver Williams recounted Ms. Raimey’s life in A Black Woman’s Voice: The Story of Mabel Raimey, “Shero”, 74 Marq. L. Rev. 345 (1991). 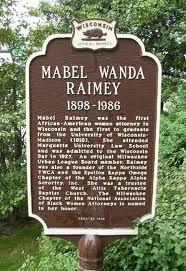 ** A historical marker to Ms. Raimey also stands outside Sensenbrenner Hall on Wisconsin Avenue. I admire Ms. Raimey for her desire to learn, her ability to push forward in the face of injustice and bigotry, her sense of fairness in representing her clients regardless of race, and her community activism. Readers: what other Marquette women lawyers have made a difference in the legal profession and the broader community? Whom do you admire? *Greta Anderson, More Than Petticoats: Remarkable Wisconsin Women, 113-21 (2004). **In her book, Greta Anderson gratefully acknowledged Professor Williams’ assistance in writing the chapter on Ms. Raimey. Mabel Raimey was a remarkable woman, but her relationship to the Marquette Law School is not always fully understood. She did not, for example, graduate from the law school. Mabel Raimey enrolled in the law school’s evening division in 1924, the year that it was eliminated. However, those who were already enrolled when the decision was made in 1924 were permitted to finish the evening course, but no additional students were admitted. She was thus one of the last evening students at Marquette until the evening program was revived in 1997. Evening students in her era were not eligible to receive Marquette law degrees, so she was technically not a graduate of the law school. Under Wisconsin bar admission rules of that era, all one had to do to qualify for the bar examination in Wisconsin was to prove that one had studied law for three years, so three years in the MU part-time program met that requirement. Since the diploma privilege was not extended to Marquette until 1934, all Marquette law students, whether they received the degree or not, were required to take the bar examination. It is also not clear how many of Mabel Raimey’s Marquette students and faculty knew she was African-American. She was by all accounts very light skinned, and given her past misfortunes that Melissa mentions above, it would hardly have been surprising if she kept her racial identity to herself. However, whether or not she was openly African-American was not likely to have affected her ability to enroll at Marquette. The law school had already accepted a small number of African-American male law students and a small number of white female students before 1924. In fact, its predecessors, the Milwaukee Law Class and the Milwaukee Law School had admitted students from both categories. Mabel Raimey’s racial identity in the 1920’s is genuinely puzzling. There is no question that Ms. Raimey indentified with African Americans during most of her life. It is also true that her photographs suggest that she had a very light complexion. There is no real doubt that the Raimeys were African American. As Prof. Phoebe Williams demonstarted in her 1991 landmark article on Raimey, her mother’s family were the descendants of freed Virginia slaves who moved to Wisconsin in the pre-Civil War era. Although it is likely that one of her ancestors was a white slave-owner, her maternal ancestry was clearly African American. Less is known about her father’s racial background, but we do know that Anthony Raimey [Ramey] was a light-skinned African American. He is listed in the 1880 United States Census as a 17-year-old mulatto, living in Tennessee. The puzzling part of the story is that the United States Census for 1920 lists all three Raimeys–Mabel, her mother and her father–as “white.” Coming just a year or two after Mabel lost her public school teaching position in Milwaukee when it was discovered that she was African American, it is not surprising that the family might have choosen to pass for white, if it had that option. From a law school perspective, this is interesting primarily because the years that Mabel Raimey–Wisconsin’s first black female attorney–spent at the law school appear to coincide with the years that she may have attempted to conceal her racial identity. Marquette records of little help in this regard. To its credit, Marquette in the 1920’s did not identify the subject’s race when it listed the names of enrolled students. Mabel Raimey was my mother’s good friend. They went to Baptist church together, and mother and my stepfather drove her. She left many things to my Mom such as pictures and Watson belongings, and mail to my mom, and her first typewriter. She did not drive and had a big heart and took care of many who could not afford her services, but she never turned them away. Mom has passed away and yet we keep the momentos. We grew up in Milwaukee and before that Hurley, WI. I am interested in reviewing any momentos or pictures of the Watson’s if you have those in your possession. Researching family history. Thank you. I too was a friend of Mabel Raimey as she was our family lawyer. Also I attended the same Baptist church as did Mabel. Her parents were among the founding members of the church. She was totally commited to her profession and refused to marry. I spoke to her last 2 days before she died.